...more than meets the eye/hand. There’s a lot happening in a magnet! Even when you think you have one big magnet in your hand, you’re actually holding millions of tiny pieces all lined up. Each little piece is like its own little magnet. One end of each piece is POSITIVE and the other end is NEGATIVE (or north and south). Positive ends pull on negative ends, and the magnet pieces line up with each other, head to tail, making one big magnet. 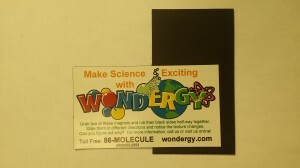 What Makes the WONDERGY Magnet Work? Magnets come in different shapes and sizes. 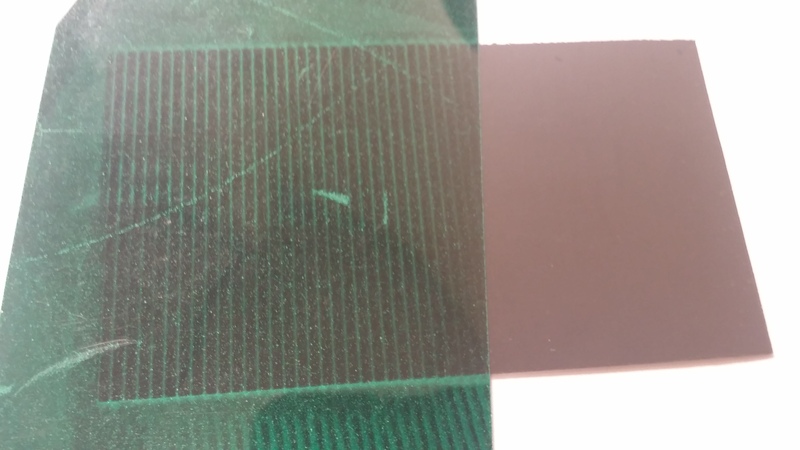 Sometimes little magnets inside a big magnet are NOT all lined up. 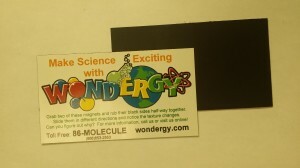 You can’t see it with your eyes, but WONDERGY magnets are made up of strips of magnets facing opposite directions. If they line up, they stick. If they don’t, they push the other magnet away. S lide them together against the “grain,” and they feel bumpy. You can’t see magnetism. You can’t even feel it! So how are magnets such great toys? They pull on each other. TRY IT! Slowly slide two WONDERGY magnets against each other. Do you feel a bumpy texture? Can you imagine a shape that would be bumpy like that? TRY IT! Turn the magnets around and try sliding them in different directions. The POSITIVES and NEGATIVES are not lining up. Now your magnets won’t even stick to each other! When you stick a magnet to your refrigerator, your magnet makes the tiny magnets in the fridge line up too. Otherwise they wouldn’t stick! Metals are especially good at lining up. TRY IT! Take the magnets around the room, and try sticking them to different objects. Do they stick? Hey! You just made millions of tiny magnets line up! Have you figured out the “magnetic texture” yet? Here’s a way to see it.